Spending an evening tasting and discussing Ontario artisan cheeses under the guidance of a passionate professional is a wonderfully indulgent experience. Adding expertly paired VQA Ontario wines to the mix only serves to increase the decadence of the experience. 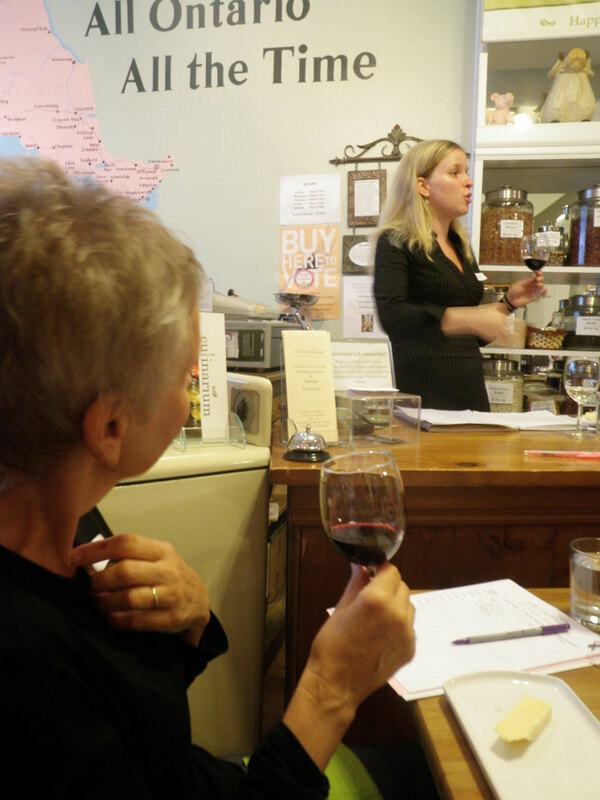 Sherinne Quartermaine talks wine at Culinarium. Culinarium hosted an evening of wine and cheese tasting last week that adhered to the Toronto gourmet food shop’s mantra “All Ontario, all the time.” Kathleen Mackintosh, founder of Culinarium, chose the evening’s cheeses, and she guided the eight eager students in attendance through the process of cheese tasting. The Wine Rack provided the VQA wines, and Sherinne Quartermaine, the store’s manager, selected a variety of Ontario wines to pair with Kathleen’s four cheese choices. Both Kathleen and Sherinne gave their students general guidelines for tasting cheese and wine, but ultimately, they agreed tasting is a personal experience. They encouraged everyone to approach tasting in whatever way worked for them. We started each pairing by tasting the cheese on its own, then the wine on its own. We discussed the flavours and characteristics of each, and then we tasted the cheese and wine together. First, we had a bite of the cheese followed by a sip of the wine, and we noted the ways in which the flavours changed, became more apparent, or were lost with the pairing. We then reversed the steps, tasting the wine first and then the cheese. The first cheese we sampled was a sheep’s milk cheese produced by Fifth Town Artisan Cheese in Prince Edward County near Picton, Ontario. The cheese, Lemon Fetish, was a firm, dry, feta-style cheese with citrus flavours. Lemon Fetish was paired with Strut Sauvignon Blanc. When the cheese was sampled first, followed by the wine, the sauvignon blanc mellowed out the strong citrus flavours in the cheese, while the saltiness of Lemon Fetish made the Strut wine taste sweeter. The tasting group as a whole agreed that when the approach was reversed, and the wine was followed by the cheese, the subtleties of the wine were lost to the strong flavours of the cheese. This was the case for most of the combinations sampled that evening, with the exception of the second pairing, which featured a bold Inniskillin Two Vineyards Merlot. The merlot was paired with a sharp 5-year cheddar produced by Maple Dale Cheese. The two paired nicely as neither overpowered the other. 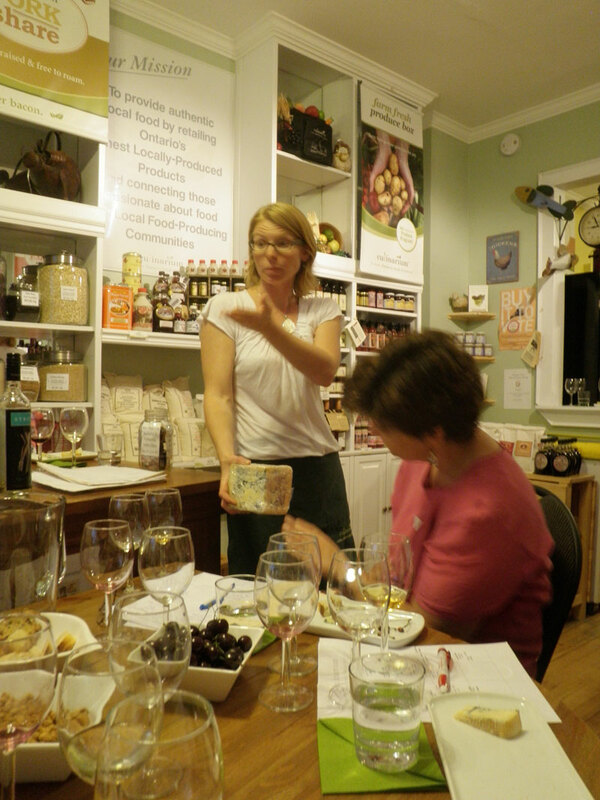 During the evening’s tasting, the passion of both Kathleen and Sherinne for the craft of Ontario’s cheese and wine producers became apparent. Kathleen explained the human quality of artisan cheesemaking, describing it as a “hand-touched” and “human-tended” craft that required patience and care on the part of the cheesemaker. Kathleen insisted this handcraft deserved the respect of the taster. She argued that a taster should never ignore the rind of a cheese. As the only part of the cheese the maker can really affect, Kathleen believes we should taste the rind of every cheese we buy, out of respect for the cheesemaker. We all gamely tried the rind of the Comfort Cream Camembert made by Upper Canada Cheese in the Niagara Peninsula. 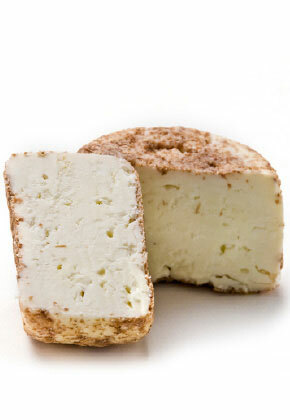 The bloomy rind added another dimension to the nutty flavours of this cheese. It was paired with a Jackson Triggs Reserve Cuvee Close, and they worked well together. The cheese made the wine taste creamier and sweeter. Sherinne told the group of tasters the price of a wine is often a reflection of the care a grape receives. For that reason, she explained, ice wines are often pricier than other varieties. She described the labour of ice-wine making, in which pickers hand pick the frozen grapes in the middle of the night, in temperatures below minus 8 degrees Celsius. In the case of Inniskillin Vidal Ice Wine, the hard work certainly paid off. The 2006 vintage we sampled is a multiple gold medal winner, and an older vintage of Inniskillin’s Vidal ice wine was served to President Barack Obama at his Nobel Peace Prize Dinner. The ice wine was paired with Glengarry Fine Cheese’s Celtic Blue. The two paired nicely. While on its own, the ice wine was a bit syrupy and sweet for my liking (with a sugar code of 24), when paired with the sharp, tangy blue, I appreciated the sweetness of the ice wine. When our four pairings had all gone down, and our taste buds were thoroughly satisfied, the night began to wind down. My tasting companion and I lingered in the store a bit longer, admiring the cheese selection. We finally took advantage of the 10 per cent discount offered to the guests, and picked up Fifth Town’s Lemon Fetish. Perhaps we will be inspired to experiment with some wine pairings of our own. A journalism graduate and budding turophile, Phoebe Powell last wrote for CheeseLover.ca about Monforte Dairy morphing into an art gallery.